In Ontario (as in many parts of Canada) it has been one of the most challenging harvests in recent memory. It has been a particularly wet fall resulting in considerable corn still in the field and including soybeans in many areas. Now winter has moved in with snow in many areas further impeding progress. To further add insult to injury, DON (mycotoxin) levels have been an issue across the province, with some reports of extreme (double digit) levels in certain areas. Some appears to be at levels making it unmarketable even to ethanol. 1,400 producers have reported damage due to DON. So as one can see this is a very extensive challenge in Ontario. As I discuss in previous commentaries the Ontario model has most but certainly not all hog producers growing and feeding their own corn. As one veterinarian I discussed this with probably said it best, that this coming year would be one with an asterisk beside it as far as breeding problems related to toxins. The extra rub is, if it weren’t for the high DON levels in corn and the tough weather, this harvest would be one for the ages. Yields for both corn and soybeans have been exceptional with many producers suggesting their best ever. 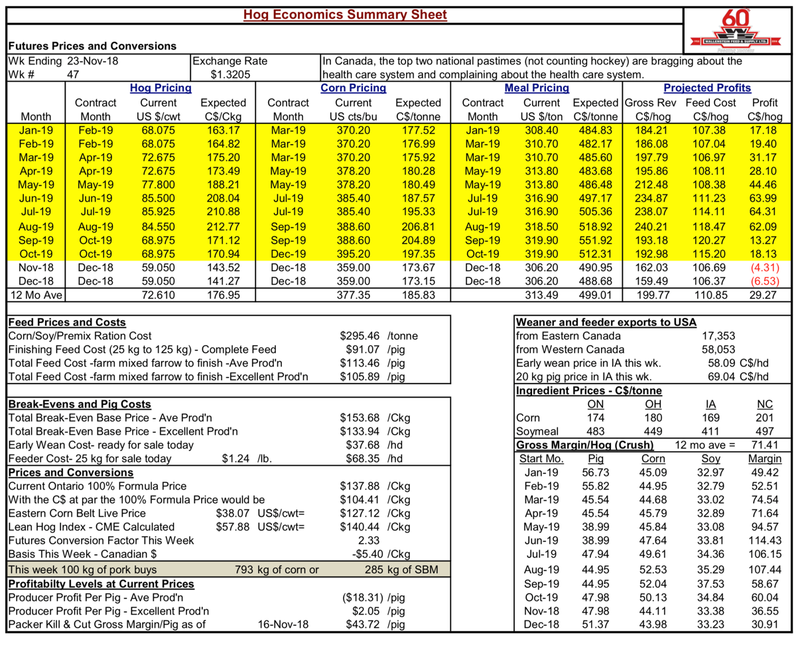 Bob Hunsberger, Wallenstein Feeds, Hog Economics Summary Sheet reminds of Tale of Two Cities “it was the best of times, it was the worse of times”. Present producer profit projection per pig with average production is (-$18.31). However average profit production for the next twelve months is projected at $29.27. Probably goes a long way to explaining the air of caution in the countryside. Lots of promise out there but things don’t feel so hot right at the moment. 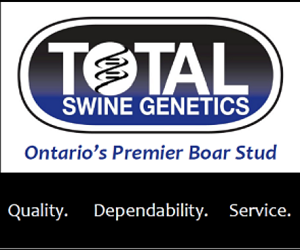 Successful Farming recently published its 2018 Pork Powerhouses listing of the top 40 U.S. hog business by sow numbers along with the top 5 Canadian sow operators. Olymel, Saint-Hyacinthe – 106,000 sows. According to StatsCan data, there were 1.245 million sows in Canada as of mid- year. That means the top 5 in Canada have a 27% share of the total. The top three in the US of Smithfield, Seaboard and Pipestone at 1.541 million would represent a very similar percentage as a share of the US total with two of them being packers as well. Where the top three in Canada are also packers. Allowing for the fact that the US industry is approximately five times larger than Canada’s is interesting to see they have followed a very similar trail of packer/producer integration. Also surprising that in percentage terms the amount is not significantly different.